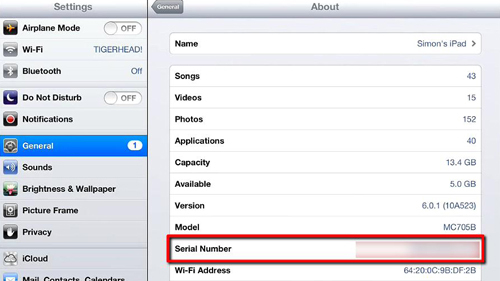 First of all you are going to need to find out the serial number of your iPad. Touch “Settings” and in the window that opens touch “General” from the menu on the left. On the right touch “About” and on the page that opens you will see the serial number at the bottom. Make a note of the last three digits of this number as you cannot copy it to the iPad’s clipboard and we are going to need it in a moment. Go back to the homescreen and open your preferred internet browser and visit the site “http://everymac.com/ultimate-mac-lookup”. You will see a text entry box on this page and you need to enter the three digits here and click “Lookup”. 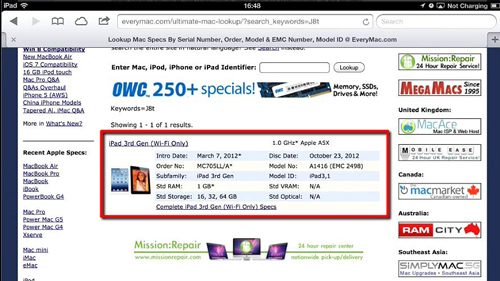 Below details of the device will appear and that is the simple process of how to check iPad version using a simple website.